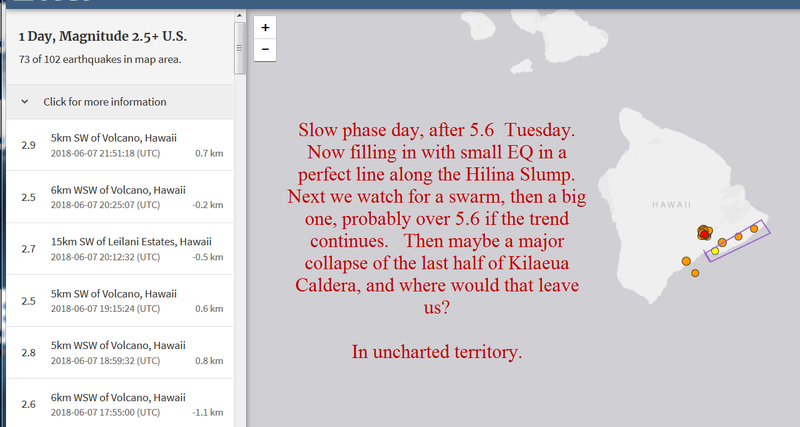 quakes are filling in perfectly along the Hilina Slump, see top image. 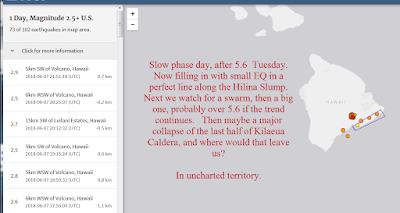 Yesterday I emphasized the now clear patterns of swarms of small quakes preceding a big Quake, rather then the small 2.5's releasing energy, and preventing a "big one", they are a great signal to an upcoming "big one"
I also "discovered" something that NO ONE has talked about. After the initial massive 6.9 EQ just barely off the shore, the 2 subsequent big EQ were not in the volcano but in the deep ocean debris field from the last Slump. See yesterdays post for that, but it is very significant. has caused 60' Tsunami, nothing to laugh at. The Tohoku Earthquake that caused Fukushima was smaller, but admittedly quite a bit wider than these "small slumps". A Big Slump could cause a Tsunami of 1000', almost hard to picture, and even after hours of research, I found no way to model it's dispersion or land entry penetration depending on location and local bathymetry. Kilauea Crater saw significant collapse. See Image. Guatemala, Madagascar, Quiet Zone in Japan (building energy), Hawaii, and Yellowstone/Steamboat are all very concerning. 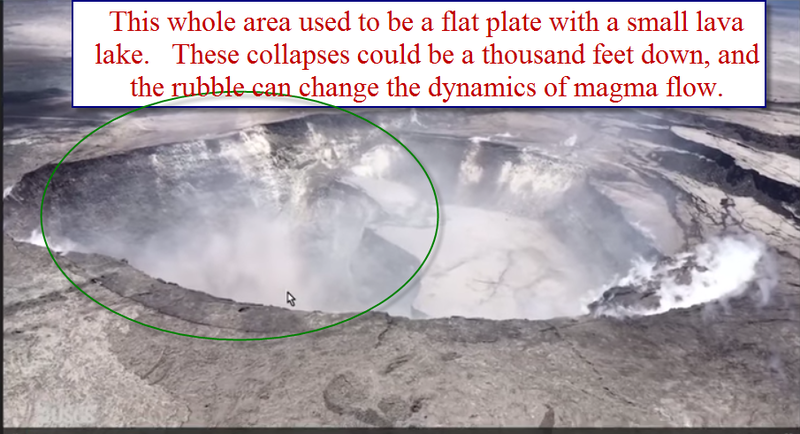 I had this crazy idea that maybe increased cosmic rays due to quiet sun et al, is activating gasses within the magna deep in the earth, and that is causing all this. LOL we will see how that Hypothesis plays out. Big Emotional Toll on Those Affected -- One of the Things is "Inability to Forecast"